Screen Time is one of the biggest highlights of the iOS 12 software. It allows the iPhone and iPad owners to track the amount of time they spend on their devices and within individual apps. It also lets them set daily time limits on specific apps. Users finally had a way to add a digital dose of self-control. And parents began using the Screen Time restrictions to control their children’s iPhone usage. At first, it seemed like an incredibly useful feature, at least in theory. But when it comes to real-life execution, the Screen Time restrictions didn’t have the same impact parents and Apple hoped. Within just ten days of iOS 12 public rollout, kids have found not one but multiple workarounds to Screen Time restrictions. Kids are much more technologically-advanced than adults in Cupertino thought. Reddit user PropellerGuy says in a thread that he limited his 7-year-old son’s screen time soon after iOS 12 came out. Just a few days later he noticed that his kid was playing games more than he was allowed to, but he couldn’t figure out how or why. Eventually, his son revealed his nasty little trick. The thread has so far received more than 8700 upvotes. What PropellerGuy’s son would do is deleting the games for which he has run out of screen time, and re-downloading it from the App Store. Thanks to iCloud, he wouldn’t lose even one bit of data, and could resume playing where he left off. Re-downloading the game means the clock would start over again for the day, giving him extra playtime without any issues. Of course, PropellerGuy (and other parents) could block it by turning off the Install Apps in Restrictions. You’ll find it in Screen Time’s settings. It removes the App Store icon from the device, but it also prevents apps from updating. So, this is not a great solution. In the same thread, Reddit user TheInspiringDad says he had blocked YouTube. But his child found a workaround to it. The kid uses the YouTube iMessages app to send himself videos. Though YouTube is technically blocked, he can still watch those videos within iMessages. Should the parent consider blocking iMessage as well? Yet another parent asked on Apple’s official support forum how she could keep her teen from turning the time and date back on an iPhone. Her teen was bypassing the Screen Time restrictions by resetting his phone’s time and date back to trick the iPhone into thinking that it was a new day. Apparently, you could do it even when the device is already in ‘down time.’ There doesn’t appear to be a fix for this parent’s problem. No matter what kind of Screen Time restrictions parents introduce, sooner or later kids will find a workaround. The best way seems to be the old-school method of physically removing the iPhone or iPad from their possession after they have spent a certain amount of time on it. It may sound harsh but you know that you are doing the right thing for your child. If you haven’t yet tried Screen Time restrictions, you can set a time limit on any app that you think you or your child is addicted to. 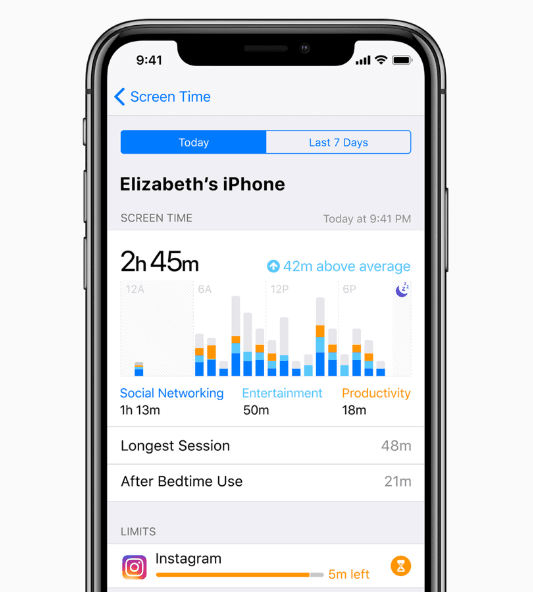 To see how much time you (or your child) are spending on specific apps, go to Settings > Screen Time > Tap the iPhone/iPad area at the top > Scroll down to see most used apps. If you want to set a daily time limit, go to Settings > Screen Time > App Limits > Add Limit > Choose a category > Add > Choose the time limit. It would be interesting to see if or when Apple brings a fix to these cheats. The iOS 12 software brings many other features such as Siri Shortcuts, a revamped Stocks app, better notifications, an improved Control Center, and performance and stability improvements. Multiple tests have shown that older iPhones and iPads got a significant performance boost after upgrading to iOS 12.